The Wyoming Range may be the prettiest mountains in Wyoming you never heard of. The begin about 20 miles south of Jackson Hole. They continue southward for many miles, paralleling the Salt River Range. 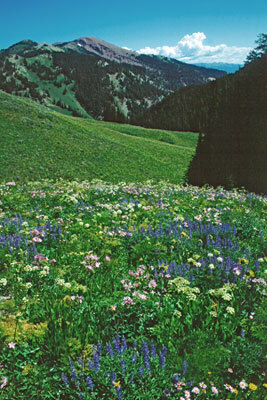 They are full of elk, and massive fields of wildlife flowers. They have been little developed because the soils are very unstable, prone to natural landslides, even without roadbuilding. Folks in Wyoming have been very generous to the energy industry, but as they move off the high desert up into the big mountains, the attitude of the citizens and many politicians is changing — both Republicans and Democrats. On this issue citizens, conservationists, ranchers and outfitters are united. They don’t want rigs up there. Here is a bit of good news, a least in the short run from the Jackson Hole News and Guide. A related article from Sunday Sept. 24. Wyoming’s Gov. Dave Freudenthal wants an oil and gas lease buyback bill. Freudenthal is seeking that some of the oil and gas leases in Wyoming’s Red Desert be bought back. I spent a week in this area in the summer of 2004. It’s amazing — huge elk right out on the desert in the middle of the summer, pronghorn everywhere, and lots of wild horses, and then, not a gas rig in sight.